Lisianthus (Eustoma grandiflorum) is an annual bedding plant known as one of the most popular cut flowers available at florists. The original wild lisianthus are native to the American southwest, but the varieties grown today have been highly hybridized and scarcely resemble their wild relatives. Lisianthus usually grows from 12 to 24 inches tall and has one to three inch diameter flowers that closely resemble roses with many layers of velvety petals. 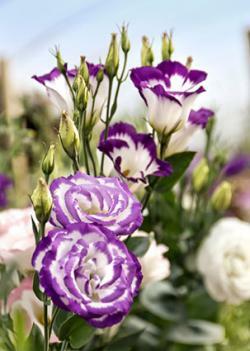 Unlike, roses however, lisianthus comes mostly in cool tones, like purple and blue. The foliage has a subtle silvery-blue hue that is also very attractive. This flower blooms in summer and is primarily used in annual beds and borders in combination with other warm season annuals. Its upright growth habit makes it best suited for the back of an annual flower bed. They are most effective when grown as a mass, rather than as individual plants, especially if more than one variety is mixed together. Lisianthus is known as one of the most difficult flowers to grow by seed. Without controlled greenhouse conditions and a strict regimen of temperature, light and humidity, it is hard to germinate the seed, much less get the seedlings to the flowering stage. For this reason, most gardeners choose to grow lisianthus as a transplant from the nursery. It is widely available with the annual bedding plants at retail nurseries throughout the country and can be grown in all zones. 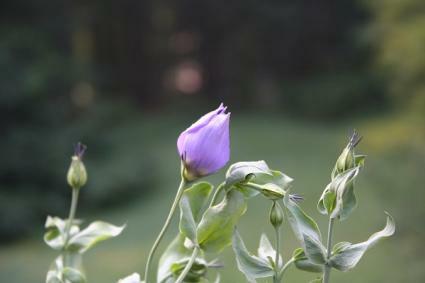 After all danger of frost has passed in spring, plant lisianthus in a location with at least six hours of sun. For best results, plant in a well-drained raised bed that has been enriched with compost. Lisianthus is also suitable for pots and planters. Despite being difficult to get established by seed, lisianthus is fairly trouble-free once it is established in the garden. It needs regular water, but little other care is required besides clipping off the spent blossoms from time to time. The tallest varieties may flop over when they are in bloom, which is easily prevented by tying them to a short garden stake with a piece of twine. Lisianthus is rarely bothered by pests or disease, other than the occasional mite or aphid attack. If either of these pests show up, they are easily treated with an insecticidal soap. 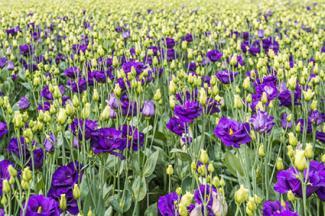 Lisianthus has been bred into a wide array of luxurious colors. 'Echo Blue' is a classic deep purple variety with double flowers that grows about 24 inches tall. 'Blue Picotee' has white petals with a purple fringe and grows about 24 inches tall. 'Lisa Pink' has single deep blooms on compact plants about eight inches tall. 'Balboa White' has double white flowers on 36-inch plants. Lisianthus is popular with florists because they last two weeks or more in a vase. Grow your own and for the cost of a single bouquet and you can enjoy them indoors and out all summer.